The truth has been turned on its head about the war in Yemen. The war and ousting of President Abd-Rabbuh Manṣour Al-Hadi in Yemen are not the results of a «Houthi coup» in Yemen. It is the opposite. Al-Hadi was ousted, because with Saudi and US support he tried to backtrack on the power sharing agreements he had made and return Yemen to authoritarian rule. The ousting of President Al-Hadi by the Houthis and their political allies was an unexpected reaction to the takeover Al-Hadi was planning with Washington and the House of Saud. The Houthis and their allies represent a diverse cross-section of Yemeni society and the majority of Yemenites. The Houthi movement’s domestic alliance against Al-Hadi includes Shiite Muslims and Sunni Muslims alike. The US and House of Saud never thought that the Houthis would assert themselves by removing Al-Hadi from power, but this reaction had been a decade in the making. With the House of Saud, Al-Hadi had been involved in the persecution of the Houthis and the manipulation of tribal politics in Yemen even before he became president. When he became Yemeni president he dragged his feet and was working against implement the arrangements that had been arranged through consensus and negotiations in Yemen’s National Dialogue, which convened after Ali Abdullah Saleh was forced to hand over his powers in 2011. Coup or Counter-Coup: What Happened in Yemen? At first, when they took over Sana in late-2014, the Houthis rejected Al-Hadi’s proposals and his new offers for a formal power sharing agreement, calling him a morally bankrupt figure that had actually been reneging previous promises of sharing political power. At that point, President Al-Hadi’s pandering to Washington and the House of Saud had made him deeply unpopular in Yemen with the majority of the population. Two months later, on November 8, President Al-Hadi’s own party, the Yemenite General People’s Congress, would eject Al-Hadi as its leader too. The Houthis eventually detained President Al-Hadi and seized the presidential palace and other Yemeni government buildings on January 20. With popular support, a little over two weeks later, the Houthis formally formed a Yemense transitional government on February 6. Al-Hadi was forced to resign. The Houthis declared that Al-Hadi, the US, and Saudi Arabia were planning on devastating Yemen on February 26. Al-Hadi’s resignation was a setback for US foreign policy. It resulted in a military and operational retreat for the CIA and the Pentagon, which were forced to remove US military personnel and intelligence operatives from Yemen. The Los Angeles Times reported on March 25, citing US officials, that the Houthis had got their hands on numerous secret documents when they seized the Yemeni National Security Bureau, which was working closely with the CIA, that compromised Washington’s operations in Yemen. Al-Hadi fled the Yemeni capital Sana to Aden on February 21 and declared it the temporary capital of Yemen on March 7. The US, France, Turkey, and their Western European allies closed their embassies. Soon afterwards, in what was probably a coordinated move with the US, Saudi Arabia, Kuwait, Bahrain, Qatar, and the United Arab Emirates all relocated their embassies to Aden from Sana. Al-Hadi rescinded his letter of resignation as president and declared that he was forming a government-in-exile. The Houthis and their political allies refused to fall into line with the demands of the US and Saudi Arabia, which were being articulated through Al-Hadi in Aden and by an increasingly hysteric Riyadh. As a result, Al-Hadi’s foreign minister, Riyadh Yaseen, called for Saudi Arabia and the Arab petro-sheikdoms to militarily intervene to prevent the Houthis from getting control of Yemen’s airspace on March 23. Yaseen told the Saudi mouthpiece Al-Sharq Al-Awsa that a bombing campaign was needed and that a no-fly zone had to be imposed over Yemen. 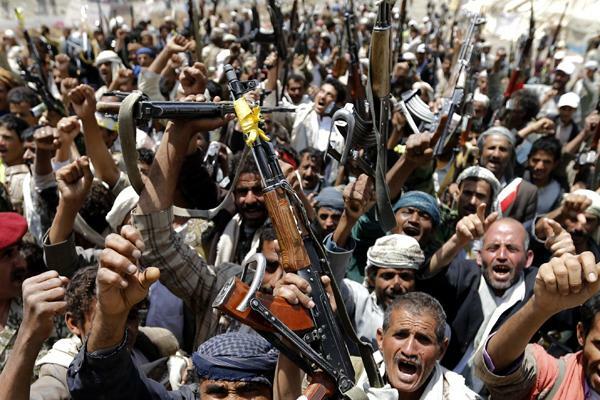 The Houthis realized that a military struggle was going to begin. This is why the Houthis and their allies in the Yemenite military rushed to control as many Yemeni military airfields and airbases, such as Al-Anad, as quickly as possible. They rushed to neutralize Al-Hadi and entered Aden on March 25. By the time the Houthis and their allies entered Aden, Al-Hadi had fled the Yemeni port city. Al-Hadi would resurface in Saudi Arabia when the House of Saud started attacking Yemen on March 26. From Saudi Arabia, Abd-Rabbuh Manṣour Al-Hadi would then fly to Egypt for a meeting of the Arab League to legitimize the war on Yemen. The Houthi takeover of Sana took place in the same timeframe as a series of successes or regional victories for Iran, Hezbollah, Syria and the Resistance Bloc that they and other local actors form collectively. In Syria, the Syrian government managed to entrench its position while in Iraq the ISIL/ISIS/Daesh movement was being pushed back by Iraq with the noticeable help of Iran and local Iraqi militias allied to Tehran. The strategic equation in the Middle East began to shift as it became clear that Iran was becoming central to its security architecture and stability. The House of Saud and Israeli Prime Minister Benjamin Netanyahu began to whimper and complain that Iran was in control of four regional capitals—Beirut, Damascus, Baghdad, and Sana — and that something had to be done to stop Iranian expansion. As a result of the new strategic equation, the Israelis and the House of Saud became perfectly strategically aligned with the objective of neutralizing Iran and its regional allies. «When the Israelis and Arabs are on the same page, people should pay attention,» Israeli Ambassador Ron Dermer told Fox News about the alignment of Israel and Saudi Arabia on March 5. The Israeli and Saudi fear mongering has not worked. According to Gallup poll, only 9% of US citizens viewed Iran as the greatest enemy of the US at the time that Netanyahu arrived in Washington to speak against a deal between the US and Iran. While the House of Saud has long considered Yemen a subordinate province of some sorts and as a part of Riyadh’s sphere of influence, the US wants to make sure that it could control the Bab Al-Mandeb, the Gulf of Aden, and the Socotra Islands. The Bab Al-Mandeb is an important strategic chokepoint for international maritime trade and energy shipments that connects the Persian Gulf via the Indian Ocean with the Mediterranean Sea via the Red Sea. It is just as important as the Suez Canal for the maritime shipping lanes and trade between Africa, Asia, and Europe. Israel was also concerned, because control of Yemen could cut off Israel’s access to the Indian Ocean via the Red Sea and prevent its submarines from easily deploying to the Persian Gulf to threaten Iran. This is why control of Yemen was actually one of Netanyahu’s talking points on Capitol Hill when he spoke to the US Congress about Iran on March 3 in what the New York Times of all publications billed as «Mr. Netanyahu’s Unconvincing Speech to Congress» on March 4. Saudi Arabia was visibly afraid that Yemen could become formally aligned to Iran and that the events there could result in new rebellions in the Arabian Peninsula against the House of Saud. The US was just as much concerned about this too, but was also thinking in terms of global rivalries. Preventing Iran, Russia, or China from having a strategic foothold in Yemen, as a means of preventing other powers from overlooking the Gulf of Aden and positioning themselves at the Bab Al-Mandeb, was a major US concern. Added to the geopolitical importance of Yemen in overseeing strategic maritime corridors is its military’s missile arsenal. Yemen’s missiles could hit any ships in the Gulf of Aden or Bab Al-Mandeb. In this regard, the Saudi attack on Yemen’s strategic missile depots serves both US and Israeli interests. The aim is not only to prevent them from being used to retaliate against exertions of Saudi military force, but to also prevent them from being available to a Yemeni government aligned to either Iran, Russia, or China. In a public position that totally contradicts Riyadh’s Syria policy, the Saudis threatened to take military action if the Houthis and their political allies did not negotiate with Al-Hadi. As a result of the Saudi threats, protests erupted across Yemen against the House of Saud on March 25. Thus, the wheels were set in motion for another Middle Eastern war as the US, Saudi Arabia, Bahrain, UAE, Qatar, and Kuwait began to prepare to reinstall Al-Hadi. For all the talk about Saudi Arabia as a regional power, it is too weak to confront Iran alone. The House of Saud’s strategy has been to erect or reinforce a regional alliance system for a drawn out confrontation with Iran and the Resistance Bloc. In this regard Saudi Arabia needs Egypt, Turkey, and Pakistan —a misnamed so-called «Sunni» alliance or axis — to help it confront Iran and its regional allies. Crown Prince Mohammed bin Zayed bin Sultan Al Nahyan, the crown prince of the Emirate of Abu Dhabi and deputy supreme commander of the UAE’s military, would visit Morocco to talk about a collective military response to Yemen by the Arab petro-sheikhdoms, Morocco, Jordan, and Egypt on March 17. On March 21, Mohammed bin Zayed met Saudi Arabia’s King Salman bin Abdulaziz Al-Saud to discuss a military response to Yemen. This was while Al-Hadi was calling for Saudi Arabia and the Gulf Cooperation Council (GCC) to help him by militarily intervening in Yemen. The meetings were followed by talk about a new regional security pact for the Arab petro-sheikdoms. Out of the GCC’s five members, the Sultanate of Oman stayed away. Oman refused to join the war on Yemen. Muscat has friendly relations with Tehran. Moreover, the Omanis are weary of the Saudi and GCC project to use sectarianism to ignite confrontation with Iran and its allies. The majority of Omanis are neither Sunni Muslims nor Shiite Muslims; they are Ibadi Muslims, and they fear the fanning of sectarian sedition by the House of Saud and the other Arab petro-sheikdoms. Saudi propagandists went into overdrive falsely claiming that the war was a response to Iranian encroachment on the borders of Saudi Arabia. Turkey would announce its support for the war in Yemen too. On the day the war was launched, Turkey’s Erdogan claimed that Iran was trying to dominate the region and that Turkey, Saudi Arabia, and the GCC were getting annoyed. During these events, Egypt’s Sisi stated that the security of Cairo and the security of Saudi Arabia and the Arab petro-sheikhdoms are one. In fact, Egypt said that it would not get involved in a war in Yemen on March 25, but the next day Cairo joined Saudi Arabia in Riyadh’s attack on Yemen by sending its jets and ships to Yemen. In the same vein, Pakistani Prime Minister Nawaz Sharif released a statement on March 26 that any threat to Saudi Arabia would «evoke a strong response» from Pakistan. The message was tacitly directed towards Iran.